It is easy to forget that Karl Barth's humble beginnings were as a country preacher. For all his theological accolades, Barth remained the humble preacher. There is no better example than Deliverance to the Captives — a collection of sermons preached to prison inmates of Basel, Switzerland. For Barth, theology remained the path of preparation for the preaching of the gospel. Thus theology is performed for the betterment of the church. This emphasis can be found in Barth's theological works. However, the best examples are found in Barth's sermons. 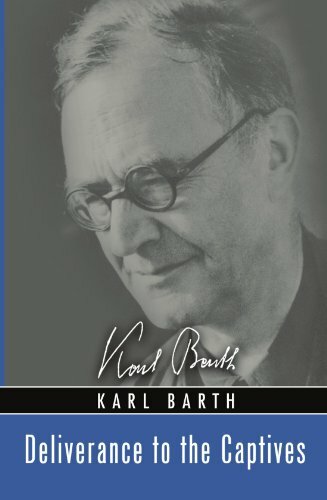 Barth's theology remains the pinnacle of Christological thinking. His emphasis on Jesus Christ being the proclaimed good news of God fueled his preaching style. The theological genius of Barth is evident, but so is the simplicity and power of the gospel. This is a message for those in academia as well as those in prison. As John Marsh says in the preface, "Barth knows that when he preaches to prisoners he is but preaching to himself, to them and to himself as dying sinners and yet as men redeemed from death by the gracious act of God" (9). Many of the sermons in the collection are Christmas or Easter sermons (e.g. "Unto You Is Born This Day A Savior," "The Great Dispensation," and "He Stands By Us"). Naturally, Barth's emphasis on the gospel involves a couple sermons on death (e.g. "Teach Us To Number Our Days" and "Death—But Life!"). When addressing these subject, Barth seems a natural speaker to his audience. Barth's sermon "Saved By Grace" is perhaps the best sermon of the collection. It is at the very least the best compressed view of Barth's application of theology to a sermon. As Marsh says in the preface, "If anyone has read Barth's theology and found it difficult to understand or to accept, let him read the sermon entitled 'Saved By Grace'; for here is truly evangelical preaching" (9). Barth's Christology is present. His Christus Victor emphasis on the atonement is present and pertinent to the walls surrounding him. Anyone interested in how a "Barthian" should preach need not look any further than Deliverance to the Captives. In conclusion, Deliverance to the Captives contains deep theology communicated in simple language. Barth the preacher is expressive, compassionate, and even humorous. The prayers that start and end each sermon are worthy of being read and studied on their own merit. Those interested in reading Barth will appreciate the brevity and simplicity of his message. Every Christian will appreciate the thoroughness of His gospel presentation — Christ is God's good word of reconciliation for the world.